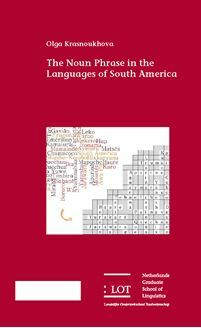 This dissertation presents the first cross - linguistic study of the Noun Phrase in the indigenous languages of South America . It builds upon a considerable amount of data that have recently become available for languages in this continent . Based on a sample of 55 languages , this study gives a novel account of the syntactic , morphosyntactic , and semantic properties of the NP . For example , the analysis shows that personal pronouns commonly receive the same possessive markers as nominal possessors , which implies that a fully grammaticalized category of possessive pronouns is rare in South American languages . In addition , the new South American data only partly confirm typological claims for tendencies in the NP domain . For instance , a morphologically distinct class of adjectives is found in many languages of the sample ; however , this class is often small , and the dominant way to encode property concepts is with verbs . Finally , this study also includes a discussion of the geographic patterning of structural features in the NP , evaluating the assumption that there is a major typological split between so - called Andean and Amazonian languages . The analysis shows that most of the features cannot be attributed to either of these larger areas . It also demonstrates , however , that there is some evidence for a broad structural division of languages into the western part of the continent ( corresponding to the Andean sphere ) and the rest of the continent . One of the features that define this split is the parameter of alienability .